One of the South's most iconic design schools needed help finding more of the right students for its unique Nashville campus. With hands-on help from its admissions staff, Generator developed a new line of print materials that helped boost attendance. O'More College of Design is one of the most unique design schools in the South. Based in historic Franklin, Tennessee, their close-knit campus offers the kind of personalized teaching that is impossible at large trade schools or four year universities. The best prospective students for O'More are committed to the kind of personal development that, upon graduation, will ensure their placement at leading corporations. Print is a key way to reach prospective students for O'More. The school's leaders regularly attend college job fair events at high schools, and host prospective students and their parents on campus. To leave a lasting impression, the school needed a family of brochures that could be handed out at these events, and mailed to prospects who signed up to receive information at their website. To get a handle on why the school's best students chose O'More, Generator conducted several on-campus focus groups with soon-to-be-graduates—many whom had transferred to O'More after first attending another university. The results of this research gave us a clear picture of the age, mindset and goals of students who are most likely to succeed as O'More students, and what messages were most compelling in their recruitment. Often we like to say, Show, don't tell. That's why we did a series of photo shoots with students in each of the school's three areas of study: Graphic Design, Fashion Design and Interior Design. The results of these shoots helped us tell the stories of these students in a very compelling way, and show prospective students what their future could be were they to follow in these students' footsteps. 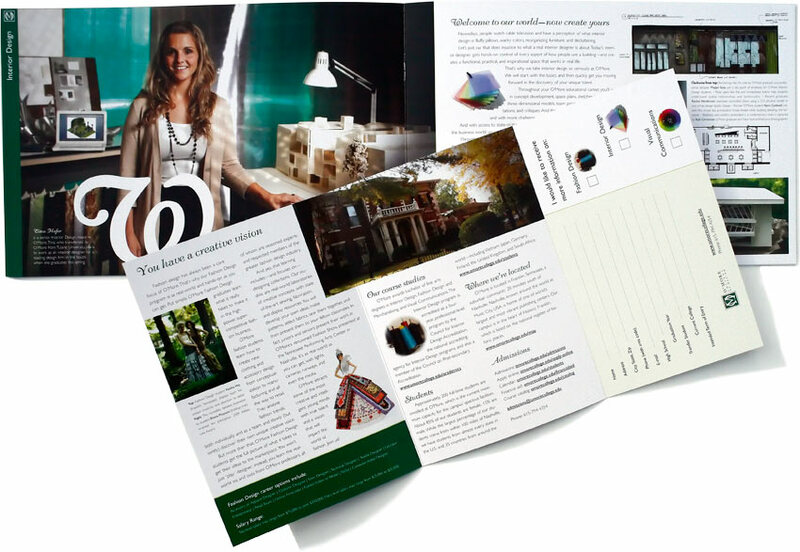 Our collateral package for O'More College of Design included an over-sized "Look Book" that devoted content to the school's unique locale in historic Franklin, Tennessee. 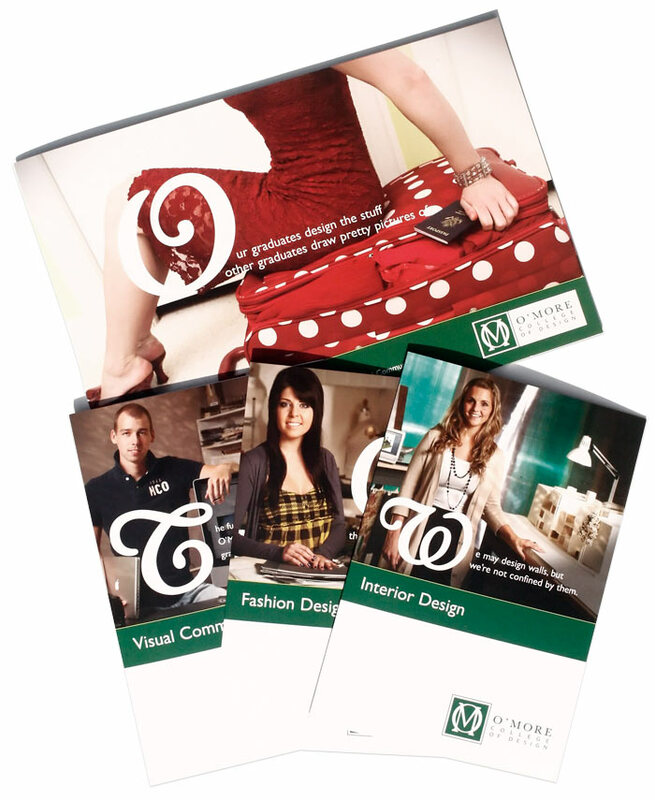 Separate brochures were designed for each of the school's three areas of study, and included relevant facts about that school's unique features and benefits. The smaller brochures included bounce-back mailer cards on the back panel, which prospective students could send to the school to receive more information.